Learn the ideal gas law. Apply the ideal gas law to any set of conditions of a gas. Apply the ideal gas law to molar volumes, density, and stoichiometry problems. So far, the gas laws we have considered have all required that the gas change its conditions; then we predict a resulting change in one of its properties. Are there any gas laws that relate the physical properties of a gas at any given time? This equation is called the ideal gas law. It relates the four independent properties of a gas at any time. The constant R is called the ideal gas law constant. Its value depends on the units used to express pressure and volume. Table 6.1 “Values of the Ideal Gas Law Constant R“ lists the numerical values of R.
The ideal gas law is used like any other gas law, with attention paid to the units and making sure that temperature is expressed in kelvins. However, the ideal gas law does not require a change in the conditions of a gas sample. The ideal gas law implies that if you know any three of the physical properties of a gas, you can calculate the fourth property. A 4.22 mol sample of Ar has a pressure of 1.21 atm and a temperature of 34°C. What is its volume? A 0.0997 mol sample of O2 has a pressure of 0.692 atm and a temperature of 333 K. What is its volume? At a given temperature, 0.00332 g of Hg in the gas phase has a pressure of 0.00120 mmHg and a volume of 435 L. What is its temperature? We are not given the number of moles of Hg directly, but we are given a mass. We can use the molar mass of Hg to convert to the number of moles. For a 0.00554 mol sample of H2, P = 23.44 torr and T = 557 K. What is its volume? The ideal gas law can also be used in stoichiometry problems. What volume of H2 is produced at 299 K and 1.07 atm when 55.8 g of Zn metal react with excess HCl? What pressure of HCl is generated if 3.44 g of Cl2 are reacted in 4.55 L at 455 K? It should be obvious by now that some physical properties of gases depend strongly on the conditions. What we need is a set of standard conditions so that properties of gases can be properly compared to each other. Standard temperature and pressure (STP) is defined as exactly 100 kPa of pressure (0.986 atm) and 273 K (0°C). For simplicity, we will use 1 atm as standard pressure. Defining STP allows us to compare more directly the properties of gases that differ from each other. Note that we have not specified the identity of the gas; we have specified only that the pressure is 1 atm and the temperature is 273 K. This makes for a very useful approximation: any gas at STP has a volume of 22.4 L per mole of gas; that is, the molar volume at STP is 22.4 L/mol (Figure 6.3 “Molar Volume”). This molar volume makes a useful conversion factor in stoichiometry problems if the conditions are at STP. If the conditions are not at STP, a molar volume of 22.4 L/mol is not applicable. However, if the conditions are not at STP, the combined gas law can be used to calculate the volume of the gas at STP; then the 22.4 L/mol molar volume can be used. 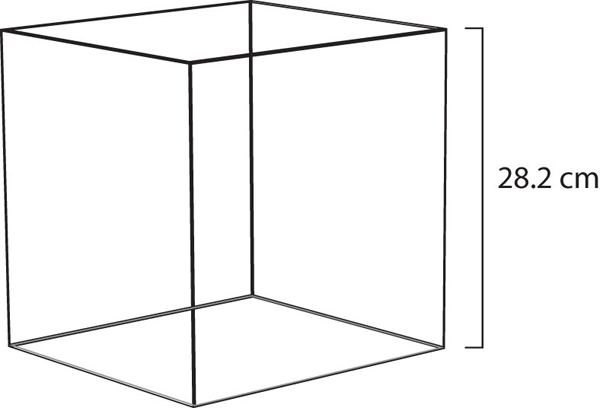 A mole of gas at STP occupies 22.4 L, the volume of a cube that is 28.2 cm on a side. How many moles of Ar are present in 38.7 L at STP? What volume does 4.87 mol of Kr have at STP? What volume of H2 is produced at STP when 55.8 g of Zn metal react with excess HCl? Alternatively, we could have applied the molar volume as a third conversion factor in the original stoichiometry calculation. What volume of HCl is generated if 3.44 g of Cl2 are reacted at STP? What is the density of N2 at 25°C and 0.955 atm? Breathing (more properly called respiration) is the process by which we draw air into our lungs so that our bodies can take up oxygen from the air. Let us apply the gas laws to breathing. Start by considering pressure. We draw air into our lungs because the diaphragm, a muscle underneath the lungs, moves down to reduce pressure in the lungs, causing external air to rush in to fill the lower-pressure volume. We expel air by the diaphragm pushing against the lungs, increasing pressure inside the lungs and forcing the high-pressure air out. What are the pressure changes involved? A quarter of an atmosphere? A tenth of an atmosphere? Actually, under normal conditions, a pressure difference of only 1 or 2 torr makes us breathe in and out. 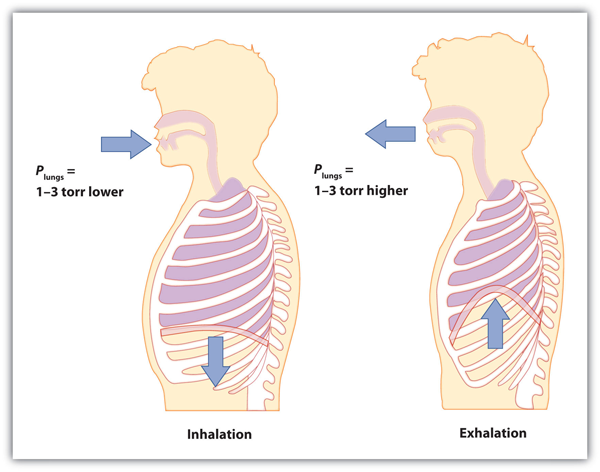 Breathing involves pressure differences between the inside of the lungs and the air outside. The pressure differences are only a few torr. This ends up being about 0.6 g of air per breath—not much but enough to keep us alive. The ideal gas law relates the four independent physical properties of a gas at any time. The ideal gas law can be used in stoichiometry problems in which chemical reactions involve gases. Standard temperature and pressure (STP) are a useful set of benchmark conditions to compare other properties of gases. At STP, gases have a volume of 22.4 L per mole. The ideal gas law can be used to determine densities of gases. What is the ideal gas law? What is the significance of R? Why does R have different numerical values (see Table 6.1 “Values of the Ideal Gas Law Constant R“)? A sample of gas has a volume of 3.91 L, a temperature of 305 K, and a pressure of 2.09 atm. How many moles of gas are present? A 3.88 mol sample of gas has a temperature of 28°C and a pressure of 885 torr. What is its volume? A 0.0555 mol sample of Kr has a temperature of 188°C and a volume of 0.577 L. What pressure does it have? If 1.000 mol of gas has a volume of 5.00 L and a pressure of 5.00 atm, what is its temperature? A sample of 7.55 g of He has a volume of 5,520 mL and a temperature of 123°C. What is its pressure in torr? A sample of 87.4 g of Cl2 has a temperature of −22°C and a pressure of 993 torr. What is its volume in milliliters? A sample of Ne has a pressure of 0.772 atm and a volume of 18.95 L. If its temperature is 295 K, what mass is present in the sample? A mercury lamp contains 0.0055 g of Hg vapor in a volume of 15.0 mL. If the operating temperature is 2,800 K, what is the pressure of the mercury vapor? What volume of O2 is formed from the decomposition of 3.009 g of HgO if the gas has a pressure of 744 torr and a temperature of 122°C? What volume of CO2 can 6.77 g of Li2O absorb if the CO2 pressure is 3.5 × 10−4 atm and the temperature is 295 K? What is the volume of 17.88 mol of Ar at STP? How many moles are present in 334 L of H2 at STP? How many liters of CO2 at STP are produced from 100.0 g of C8H18, the approximate formula of gasoline? How many liters of O2 at STP are required to burn 3.77 g of butane from a disposable lighter? What is the density of each gas at STP? 18. What is the density of each gas at STP? 19. What is the density of SF6 at 335 K and 788 torr? 20. 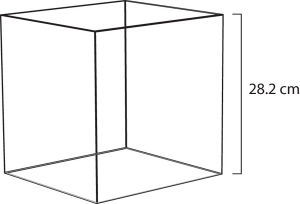 What is the density of He at −200°C and 33.9 torr? 1. The ideal gas law is PV = nRT. R is the ideal gas law constant, which relates the other four variables. The Ideal Gas Law and Some Applications by Jessie A. Key is licensed under a Creative Commons Attribution-NonCommercial-ShareAlike 4.0 International License, except where otherwise noted.